It’s not enough that North Korea should abruptly cancel South-North talks on military tensions and another long-awaited round of reunions of fast-fading families divided by the 1950-53 Korean War. Now we’re not even sure Kim Jong-Un will go through with his summit with U.S. President Donald Trump. It’s hard to tell what will happen next in the era of fake news. Or, if fake news is a bit of a distortion, then misleading news. The most misleading story on the near horizon is the shutdown of North Korea’s nuclear test site at Punggye-ri under Mount Mantap. Next week we’ll witness, live on TV, destruction of the site in the mountainous northeast as evidence of Kim’s willingness to talk about giving up his nuclear program when or if he sees Trump in Singapore on June 12. Officers from the Korea Meteorological Administration point at the epicenter of seismic waves in North Korea, emanating from the nuclear site at Mount Mantap. The Punggye-ri site was already largely destroyed over the course of six nuclear tests, climaxed last September by the explosion of a hydrogen bomb. 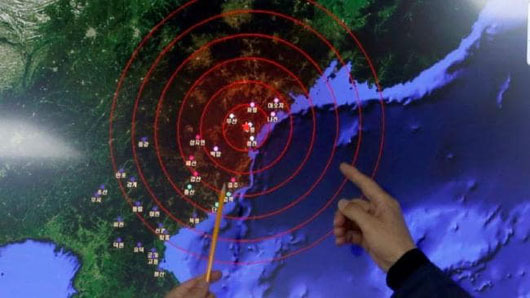 That blast caved in portions of the mountain into which North Korean engineers had planted it. Journalists invited to the scene should hear explosions blowing up some of the remaining tunnels whose doors will be sealed. Already, engineers have done away with much of the wreckage. Kim is staging the event to show his good faith about giving up his nukes while we search in vain for signs he’s going to open up the doors of the Yongbyon nuclear complex and welcome foreign engineers and technicians deployed to pick up his treasured warheads. Nor is it likely he will assent to removal of the reactor that produced the plutonium for them, though he may consider locking it up as in the era of the 1994 Geneva framework agreement. Still more difficult to imagine is the sight of North Koreans guiding all these nosy people to where they’re fabricating highly enriched uranium for still more warheads, including possibly the one they exploded in September. It was the discovery that the North Koreans had a highly enriched uranium (HEU) program that led to the breakdown of the Geneva framework in 2002, including the expulsion of inspectors sent out by the International Atomic Energy Agency (IAEA) to make sure they did not start up the reactor at Yongbyon. Then came North Korea’s withdrawal from the nuclear non-proliferation treaty. Now John Bolton, President Trump’s hawkish national security adviser, says Trump won’t settle for less than abandonment of everything, including the sites from which they’ve test-fired long-range missiles. Given all that, annihilation of the Punggye-ri site obscures the reality that Kim wants desperately to cling to the nuclear program he inherited from his father, Kim Jong-Il, only to have it blow up in his face in the nuclear test last September. As images of the site’s destruction appear on television, it’s unlikely many viewers will see through the sham intended to deter Americans and South Koreans from pressing too hard for the complete end to the program. Nor is the upcoming show at Punggye-ri the only example of misleading news. What about the release of those three U.S. citizens, all Korean-Americans, who had been imprisoned on the vaguest of charges, two of them arrested at the Pyongyang airport as they were about to leave after brief stints at the Pyongyang University of Science and Technology? The way Trump played it, their arrival dramatized what a great guy Kim is and how the summit should be a real win-win for everyone. Nowhere in the happy talk or the breathless reporting did anyone on TV ask, Why were these guys imprisoned in the first place and why weren’t they released normally? Why did Kim wait until he had U.S. Secretary of State Mike Pompeo in Pyongyang sealing the deal for the June summit, picking up the three and saying how nice Kim was to free them? One might think Kim had morphed into a great humanitarian. No wonder Rodong Sinmun, Pyongyang’s party newspaper, is so upset with the Department of State for reporting anywhere from 80,000 to 120,000 stashed away in the North’s gulag system, doing slave labor, facing torture, execution or death from hunger, disease or overwork. How dare the Americans say such nasty things? Kim evidently thinks he can manipulate his summit with Trump by threatening not to hold it if the Americans displease him. The U.S. may not be intimidated so easily into canceling war games, but one thing is sure: Trump won’t say a word about human rights abuses in North Korea while Kim fools everyone into thinking he’s giving up his nuclear program.